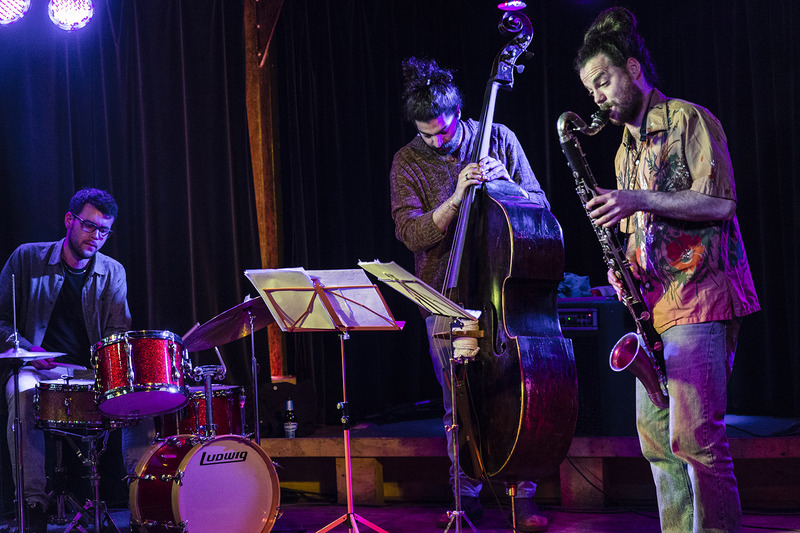 Ziv Taubenfeld (bass clarinet); Shay Hazan (double bass); Nir Sabag (drums). Born in Israel in 1986, Ziv Taubenfeld is a young, up-and-coming talent on bass clarinet and one of the best improvisers around at the moment. He first studied in Israel, then in the Netherlands. He lives in Amsterdam and has worked with, among others, drummer Han Bennink, clarinetist Ab Baars and composer-pianist Guus Janssen. Taubenfeld is currently the leader of the trio Bones whose other members are his childhood friends: drummer Nir Sabag and bassist Shay Hazan. Taubenfeld also plays with the bands Kuhn Fu, Plots and XPE. Hazan is also from Israel and studied at the Jerusalem Academy of Music and Dance. Drummer Sabag trained at the Israel Conservatory of Music in Tel Aviv. The trio's self-titled debut album was released in 2016. The second release by this Netherlands-based group is expected later this year.